With its new IntelliPAP line of CPAP and Auto-CPAP machines, DeVilbiss is offering customers an exciting alternative to higher-priced machines from ResMed and Respironics. However, DeVilbiss did not cut corners in offering an attractive price - the IntelliPAP is built for durability, as evidenced by the rugged design of the humidifier chamber (high-impact Lexan and stainless steel plate, instead of low-grade plastic and aluminum), special baffling system to prevent water intrusion from the humidifier, and industry-leading 5-year warranty on the machine and humidifier. With all of this comes an innovative design, sporting the smallest footprint of any machine-humidifier combination (6.5"W x 6.9"L x 4.2"H), intuitive, user-friendly control panel, and the quietest flow generator on the market at 26 dBA (compared to 30 dBA for the competition). 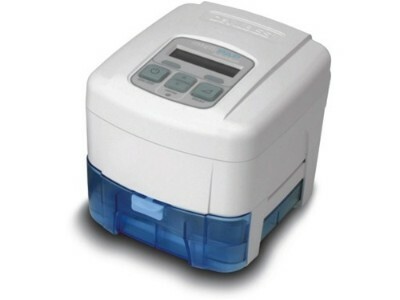 Add to this the completely integrated humidifier design (without extra power cables or clunky in-line transformers), automatic altitude compensation, and other handy features like user-adjustible pressure ramp, SmartCode compliance tracking and easy-to-read backlit LCD display, and the IntelliPAP becomes a compelling choice for a back-up or full-time CPAP machine. I have bought 3 cpap machines from these people during the past 10 yrs. last 2 devilbiss because of their compact size, no nonsense design and low price. They are all still operating. Shipping has always been rapid and service competent. Have been on a cpap machine since I was 39, I am now 54 and have been using a large dinosaur of a cpap machine(different brand) with a separate humidifier which is equally as large (it has worked great for the past 15 years). I researched machines because I am sick of lugging the old, heavy one through airports or even when I travel by car for overnights. This machine is wonderful! The smart-flex feature is nice but after 2 weeks I had to adjust it because it wouldn't allow me to fully exhale all my lung air before it started to force air back into my lungs, causing me to feel like I was breathing too rapidly. I checked the book then, I fiddled around with the settings and now it has worked better than the old machine. The size is just perfect for travel as is the weight. I give it a thumbs up! Now if I can get insurance to cover some of it I'll be happier but if they don't it will still be worth it. Very quiet & efficient. I like the humidifier - not too hot but very comfortable. I am new to Cpap and still not totally adjusted to mask & machine but trying to adapt. I have traveled with machine already & find it easy and convenient. Prompt service and quick delivery. It works great - relatively quiet - sometimes get the darth vader sound - but probably because the way the nasal pillows fit - although I put a pillow over the top of the machine to cut down on breathing noise. Very pleased with machine. Este CPAP es silencioso, espero que dure así un buen tiempo. Me gusto este equipo. I've used a CPAP for almost 10 years, and I love this one. It's compact, quiet, and the ramp up is gentle. I love the fact that it starts up when I put on the mask and start breathing (no need to turn it on). The water reservoir is a little tricky to separate from the main base, but I was able to learn pretty quickly. Much, quieter, responsive and easier to use than my previous CPAP. Excellent service; fast shipping. I am very pleased with the cpap that I ordered. Shipping was quick. I had it in less than 24 hours. Super quiet, and a great deal. This machine is quiet and efffective. I bought it so that I could get my apnea statistics form it, but I can't figure out how to do this. It should be easier, just put the stats on a memory card and stick it in your ocmputer to get the printouts. It's as quiet as they say it is. Easy to set up. I've had a CPAP machine now for 7 years, but it was a big unit, heavy, and louder. I bought the DeVilbiss IntelliPAP Standard CPAP Machine with SmartFlex and Integrated Heated Humidifier mostly for travel but since I got it 10 days ago and have used it every night, it will be my main CPAP. The SmartFlex is great. DeVilbiss IntelliPAP Standard, one of the best. I had a different make of CPAP machine and the humidifier went out. So I purchased a DeVilbiss IntelliPAP Standard CPAP machine w/ Integrated Heated Humidifier and I have not been disapointed. This machine is everything the company says it should be. I have had this machine for going on three months and I love it. It is so quiet, it doesn''t keep me awake at night, like my old CPAP machine did.